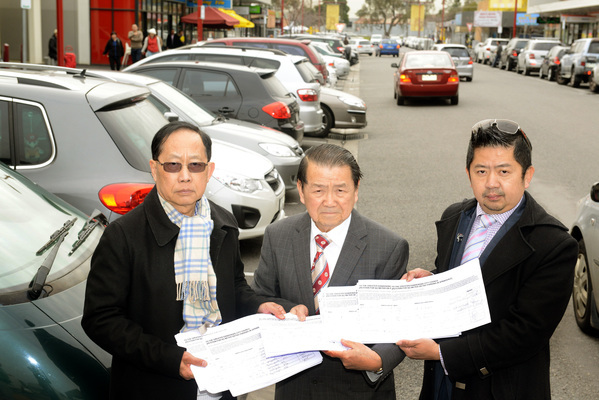 GREATER Dandenong councillors’ support for on-street parking meters in Springvale could cost them the “ethnic” vote, says councillor Youhorn Chea. Cr Chea’s third – and apparently final – formal attempt to prevent the installation of meters was defeated 6-4 at a council meeting on Monday. He told the Journal that he could do no more to stop the $1.20-an-hour meters being launched within weeks. Cr Chea predicted the issue would cost Springvale-based councillors Sean O’Reilly – who is also mayor – and Loi Truong their seats. “Perhaps the Vietnamese community need to get another representative to represent them much more than Loi. Cr Chea said the issue will also loom large in Greater Dandenong’s other wards in next year’s elections, singling out other pro-meter councillors Peter Brown, Maria Sampey and John Kelly. On Monday, Cr Brown backed the meters after recently telling the Journal he would oppose them. “The people who come to Springvale shopping centre – the majority come from Cr Peter Brown’s ward and Dandenong as well,” Cr Chea said. “All the Cambodian community and Asian community go shopping in Springvale. Cr Roz Blades told the meeting the meters would drive shoppers out of ‘Sensational Springvale’. Cr O’Reilly told the Journal on Wednesday there had been “no substantive change” in his support for meters in recent months, describing them as increasingly a “fact of life” across Melbourne. “At peak times, Springvale’s traffic and parking is congested. On-street premium parking spots are 97 per cent full; in the No. 8 (multi-deck) car park is at most half full. Cr O’Reilly said the meter solution would lead to the No. 8 facility being better utilised and in turn, more growth in business activity. “I don’t know how the case can be made for an Armageddon situation, and suggest it will lead to tumbleweeds tumbling down the empty streets. The expected $1 million annual revenue would be wholly invested in central Springvale – projects such as streetscaping Springvale Road or creating a walk-through from Springvale station to Balmoral Avenue. Cr Truong told the Monday meeting he had fought for a pick-up and drop-off zone, knowing that most councillors supported the meters. “As a councillor, we have to think of the people’s need, to fight for the community. Springvale Asian Business Association president Daniel Cheng, whose group had collected about 1900 signatures against the meters, said he had been confident before the meeting. He said he was particularly disappointed that councillors Truong and O’Reilly voted for the meters. “They stay in the ward but they can’t see the damage it would cause in the area.